Welcome to Week 91 of Mother 2 Mother’s Sunday’s Best Linkup. We’re continuing our Boo, Scary Nights theme. Halloween is around the corner. Everyone will be in search of the perfect costume for a night of spooky characters and delicious treats. We’re looking for crafts, recipes, DIY, mantel makeovers, porch decorating tips and more. 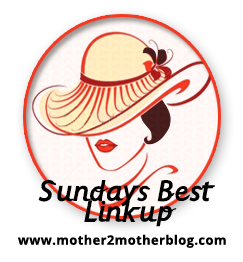 Welcome to Week 81 of Mother 2 Mother’s Sunday’s Best Linkup. We’re heading to the beach this week to ride some waves. Get your sunscreen, beach towels, snacks, and chair. We’re starting our Beach Party theme this week. We are looking for all things that pertains to the beach. Where to go, snack ideas, safety tips, games, travel tips and anything else you would like to share to help inspire us this summer! Welcome to Week 80 of Mother 2 Mother’s Sunday’s Best Linkup. It is really hard to believe that we are rushing full-blast into mid-summer already! The seasons seem to pass so quickly as the years go by. We are continuing our Let’s Celebrate Summer theme this week. We are looking for all of those fun summer recipes and BBQ tips, backyard makeovers and DIY projects, gardening ideas, cocktails to cool off after a hot day, brunch and picnic ideas – anything you would like to share to help inspire us this summer! Each week your hosts will select their favorite post and it will be featured the following week. An image from your post will be used on our linkup post the following week with a link back to your blog. Be sure to check back to see if you’re a Sunday’s Best Featured Blogger. All Featured Bloggers will have their posts pinned to the Rhonda’s Sunday’s Best Pinterest Board and Kim M. pins the weekly featured bloggers to her Sunday’s Best Linkup Pinterest Board too! Welcome to Week 76 of Mother 2 Mother’s Sunday’s Best Linkup. We’re starting our Red, White and Blue theme this week. We’re celebrating the 4th of July and we‘re looking for crafts, recipes, party ideas, decorating inspiration, gift ideas, and anything else you would like share to inspire dishes and decorations. Just link up whatever post you would like to share. We would love to have parenting tips, DIY projects, homesteading, homeschooling, makeovers, cocktails, and your posts on family and life. Your linkups and giveaways are welcome here too. Anything goes, as long as it’s family friendly and you may linkup as many posts as you would like. Be sure to tell your friends they will want to join the festivities too. Welcome to Week 75 of Mother 2 Mother’s Sunday’s Best Linkup. We’re continuing our Father’s Day celebration this week. Our theme is World’s Greatest Dads. I sure miss my dad who’s in heaven, and would give anything to spend another minute with him. I’ll be celebrating him in memory. We’re looking for crafts, recipes, party ideas, decorating inspiration, gift ideas, and anything else you would like to post to dad.